Работает функция предварительного просмотра графических файлов. Compression and Extraction: Zip(z01), ZipX(zx01), TAR, TGZ, 7Z(7z.001), LZH, ISO, EXE(e01). Support for Unicode to display international characters. For compression or extraction, foreign-language file names are sometimes fragmented. 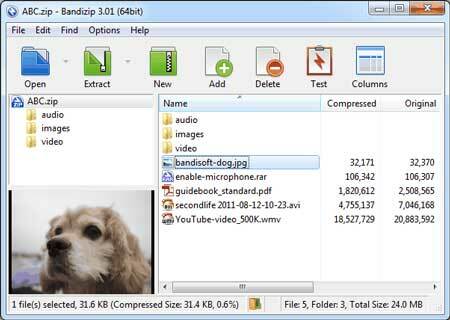 With the 'Code Page' or 'UTF-8 Save' function, Bandizip helps to display the filename perfectly. 'File Integrity Check' ensures that a file is compressed in the right manner and there is no problem with it.